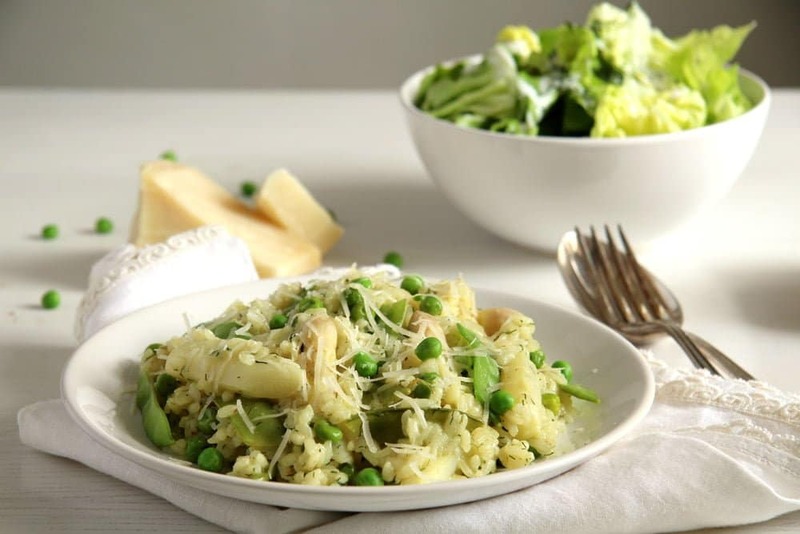 A spring asparagus risotto with two kinds of peas, Parmesan and lots of dill, what better way to celebrate fresh spring vegetables. This could be an appropriate dish to serve your mother on Mother’s Day tomorrow. You should not forget the cake, you could try this Strawberry Cheesecake for instance, but if you want more than cake, this asparagus risotto would be perfect. Light, creamy and delicious! I always associate risotto with women, to tell you the truth, I always feel risotto is something that women particularly enjoy and that despite the fact that my own husband loves risotto just as much as I do. 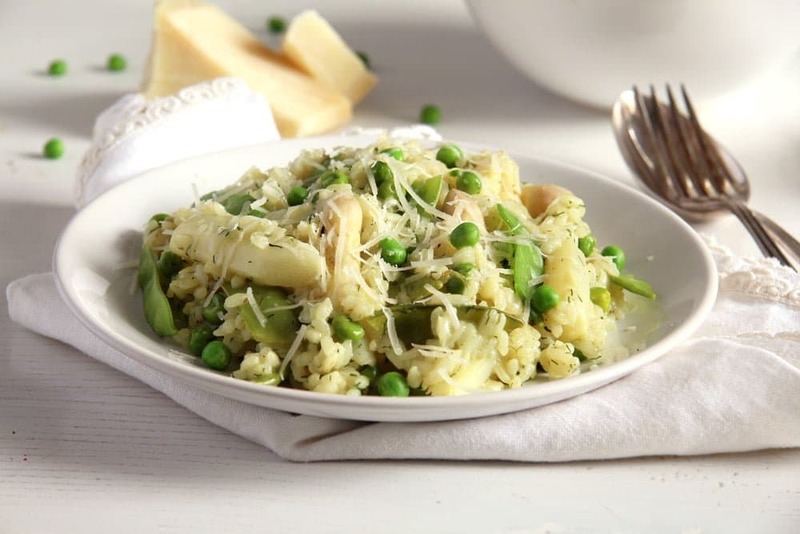 But the look of a risotto, the name of it, the versatility and the “no meat”, cheesy deliciousness make it, in my eyes, something for the women. So don’t hesitate to cook this for your mother, I am sure she would love it. Risotto is a quick, easy to make dish having a bad reputation, I think. 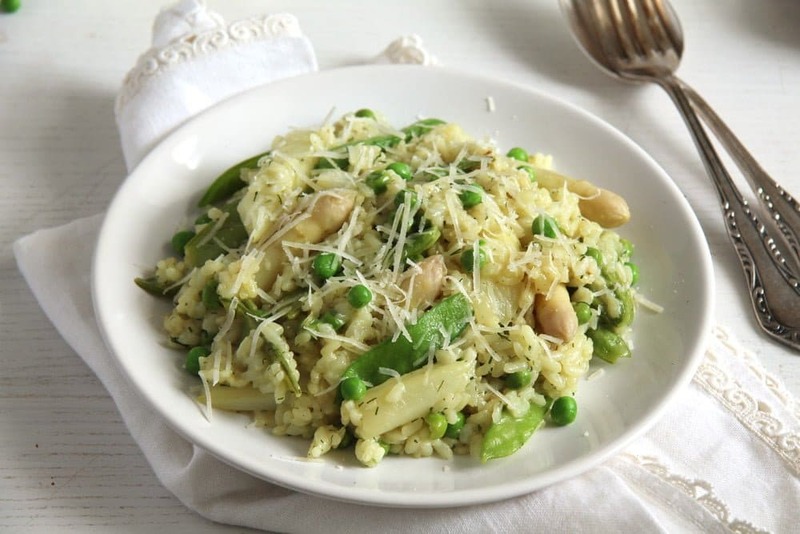 Many people I know never dared making a risotto, because many recipes out there state that they have to stand by the stove for half an hour, stirring the risotto continuously. Well, I never do, and I still loved all the risottos I have ever made, and I have made many, many of them. I stirred it continuously only once, out of curiosity, and I didn’t really notice any difference in the end. It was delicious, but not more than it normally is when I don’t stir all the time, so I let it be and continued making the risottos my usual way, which is, adding the broth little by little and stirring well after each addition, every 3-4 minutes or so. I made this risotto with white asparagus, but you could take the green one instead. Just cook the green asparagus pieces a little less than I cooked the white asparagus, the vegetables should still have a nice bite. Use a good quality vegetable broth, that is essential when making risotto, in my opinion. And keep some of the asparagus’ cooking water, just in case you need more broth towards the end of the cooking process, you could use that instead. Otherwise I wish all the mothers out there a Happy Mother’s Day! Remove the lower, woody parts of the asparagus stalks. Peel the stalks with a vegetable peeler, starting under the head of the stalk. If you are using green asparagus, only remove the woody parts and peel the lowest part of the stalk. Cut each stalk to obtain smaller 3-4 pieces. Keep the heads of the stalks separately. Bring a large pot of salted water to a boil. Cook the asparagus stalks for about 8 minutes, add the heads of the asparagus and continue cooking for another 5 minutes or so. The vegetables should still have a bite, they will continue cooking for some extra 5 minutes together with the rest of the dish. Drain and reserve some of the liquid. If you use green asparagus, cook it for a shorter time, maybe a total of 8-10 minutes. Check after 7-8 minutes to make sure it doesn't get too mushy. In the meantime chop the shallots very finely. Heat the olive oil in a larger, deeper pan. Cook the shallots until translucent, add the risotto (unwashed) and stir well until the rice is coated in oil. Continue stirring until the risotto becomes translucent as well. Add the white wine, stir well and allow the wine to evaporate. Start adding the vegetable broth, about 1 cup at a time, stirring well after each addition and adding the next cup when the previous has been completely absorbed by the rice. Continue this process for about 15 minutes, then add the asparagus and both kinds of peas and continue cooking for 5 minutes or until the risotto is done. Check the cooking time written on the risotto packet and add the veggies during the last 5 minutes of the cooking process. If you're out of broth but the risotto isn't quite done, add some of the reserved asparagus water. Add 2/3 of the grated Parmesan, the butter, adjust the taste with salt and pepper and sprinkle the chopped dill on top. 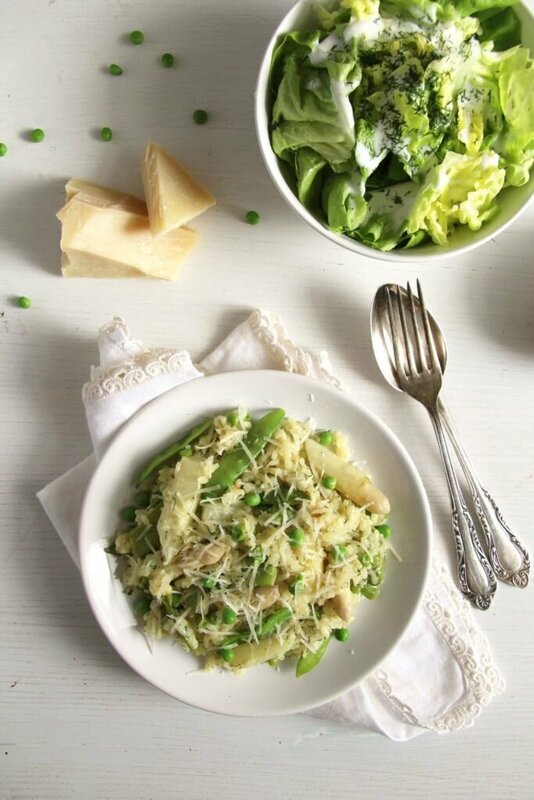 Let stand for 5 minutes and serve with the rest of the Parmesan and a green salad. 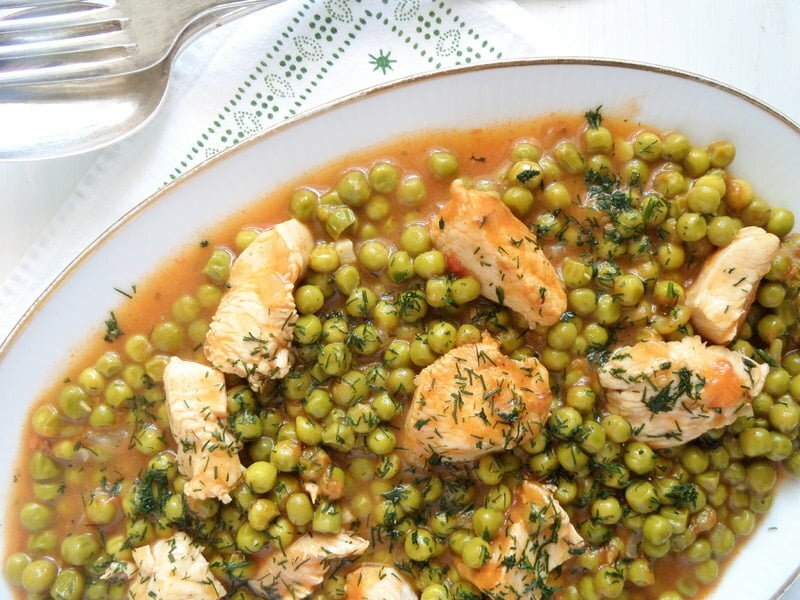 A perfect spring dish! My mom for sure will love this too. Happy Mother’s Day to you, Adina. I absolutely LOVE risotto! It’s such a blank canvas that you can add anything to it that you love to eat. 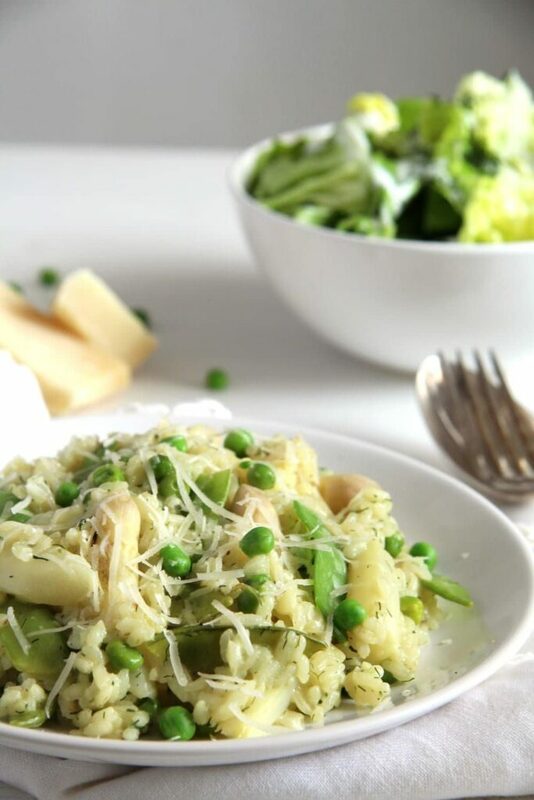 Asparagus risotto is one of my all time favourite spring foods! 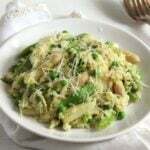 This version with snap peas and green peas sounds even better!! !